Every now and then a “trendy” cake seems to be appear at every Café, Party and Blog. The cake de jour I have come across over the last few months has to be Nigella Lawson’s Chocolate Guiness Cake. I first tried it at an office bake off and then it practically stalked me at various birthday parties, Cafes and Restaurants and I even overheard people talk about this amazing Chocolate Guiness Cake recipe once. Now, I’m not a Guiness drinker and if you are also not keen on the Irish stout beer, don’t be put of (most people, especially guys, will probably be anything but put of about an extra dose of Guiness!). I can’t say, that I taste the Guiness as such in this recipe. It just seems to give the cake a richer and deeper taste. However, if you really don’t want Guiness in your cake, try it with some non-alcoholic malt beer instead. I tried this in Germany (with “Malzbier”), where Guiness is not that easy to come by and it tasted almost exactly the same. 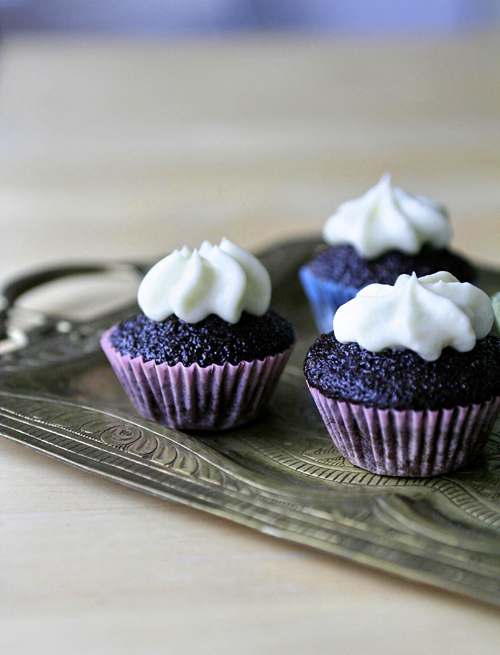 I therefore decided that Chocolate Guiness Cupcakes would be the way forward – small but with a good spread of icing! I made both, mini versions – which I really, really liked – and the normal, fairy sized cupcakes and from this recipe I got tray of 20 normal sized ones, which I didn’t fill that full so that I had enough left for a tray of 12 mini ones as well. So I’d say, the recipe is for about 24 normal cupcakes – and if you only want mini ones, you will probably get double that, if not more! Preheat the oven to gas mark 4/180 degrees and line your muffin tray with cupcake cases. Pour the Guiness in a large saucepan, add the butter and heat until the butter’s melted. Then whisk in the cocoa and sugar, with a whisk or wooden spoon. In another bowl/jug beat the sour cream/crème fraiche with the eggs and vanilla extract, then pour into the brown butter-beer fluid in the pan. Mix the bicarbonate of soda with the flour and add this in as the last ingredient, again mixing it in with your whisk or wooden spoon. 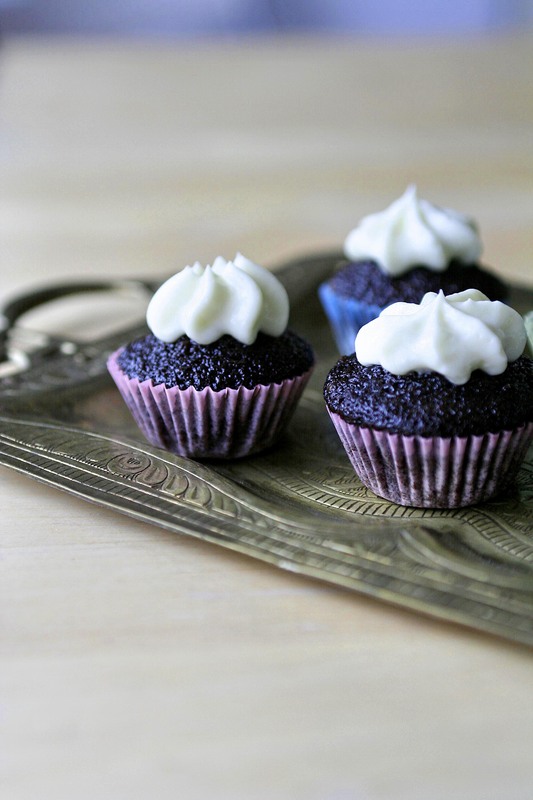 The batter is pourable so you can use a small ladle or jug, to fill your cupcake cases. For the mini cupcakes a piping bag with a big nozzle or a squeezy bottle works best. You can fill the cases almost to the top, if you like, as the black colour of the risen cakes looks quite nice over the cases. Bake the mini ones in the oven for circa 10-12 minutes and the bigger ones for about 24 minutes. Do the toothpick test for both sizes to make sure they are baked through: they are ready, if the toothpick comes out clean. Let the cakes cool down in the tray for about 10 minutes then transfer them onto a wire rack. For the icing, lightly whip the cream cheese with an electric whisk until smooth, then add the icing sugar and carefully (or your kitchen will be covered in icing sugar) and slowly (or you’ll have lumps) whisk it in. Add the cream and beat again with the electric whisk until it makes spreadable consistency. Ice the completely cooled cakes and if you don’t eat them all at ones, keep them in the fridge. They cakes still taste good up to 2 days later! 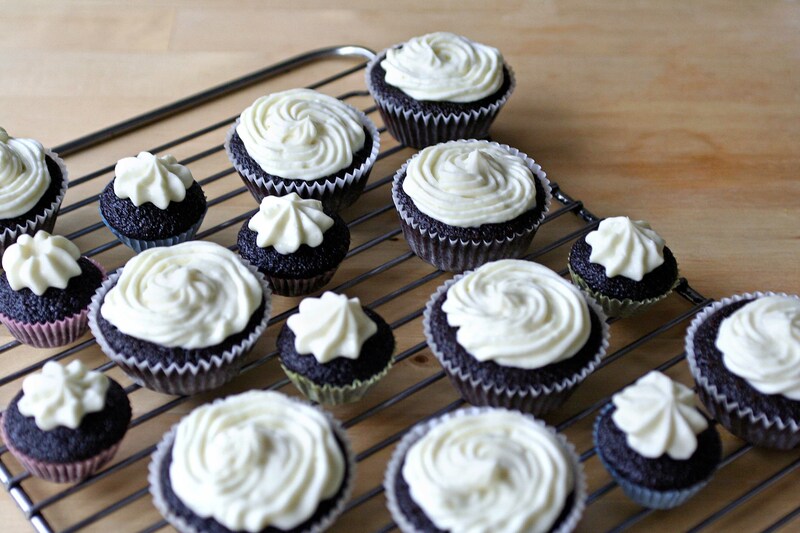 This entry was posted in Cupcakes and tagged chocolate, chocolate cupcake recipe, cream cheese frosting, frosting, guiness cake, pretty, recipe, sweet cupcake, tasty, treat. Bookmark the permalink. I can confirm that these are scrumptious. Recipes go viral when they work! A passing note about malt drinks. I was in Reykjavik last weekend. At a restaurant, I was avoiding drinking the very pricey wine and asked what the local soft drinks were. I ended up sampling the Icelandic ‘Christmas soda’, which was a Fanta-like orange fizz topped up with a non-alcoholic malt drink. It was surprisingly delicious.